Holy schnikes you guys!! 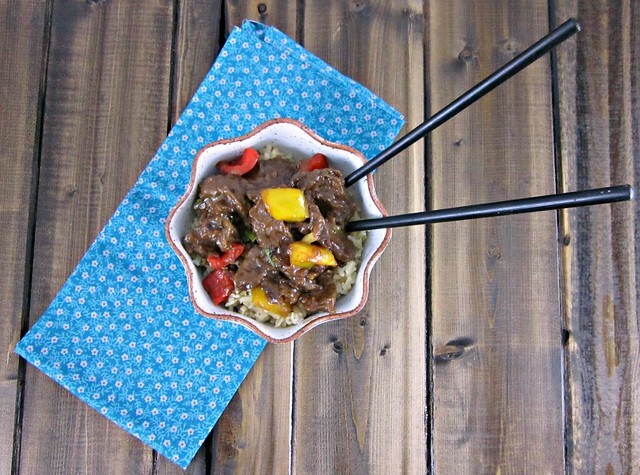 If you are a stir-fry fan (even if you’re not), then you 100% need to try this recipe. Even if you don’t like venison. Hell, even if you don ‘t use venison. The sauce and the added peppercorns are insane. Now I like a good stir-fry, and I’ve tried a lot of varieties, but I can’t say that I’ve ever had one that I oohed and aahed over like this one. I devoured it, no joke. It was insane. I know I said that already, but it was. And of course, stir-fries are such simple meals to make. Waiting on the rice to cook was the hardest part, no joke. Almost makes me miss the days when I used the instant rice. Waiting 45 minutes is haaaaard. J was also a big fan of this dish, which is no surprise. I mean, it does involve venison so…hard to go wrong there, where he is concerned. Now if you are not a venison fan yourself, I’m quite sure you could substitute beef instead. But I say try the venison. I’ll always say to try the venison. Always. I made this for the first time in December, and then again this month. Since I’m struggling with enjoying most food these days, I figured that it’s best to stick with things I know I really loved the first time around, so at least I will probably not hate it right now with these wacky pregnancy taste-buds. Today I’m officially in the 2nd trimester (14 weeks!!) so here’s to hoping my taste buds decide to be nice to me again!! I’m sure there will still be things that I don’t love that I used to, but not liking much of anything at all is not working for me. At all. But you lucky ducks that can enjoy all the foods, need to try this stir-fry out, ASAP! Because you will be able to enjoy it in all its glory and deliciousness. In a small bowl, combine the soy sauce through salt for the marinade. Mix well and then add in the cornstarch and stir until well-combined. Place the venison slices into a large, resealable plastic bag and pour the marinade on top. Seal the bag and use your hands to squish the meat around so that it is all well coated with the marinade. Refrigerate for at least 30 minutes, up to 24 hours. In another bowl, combine the sauce ingredients (cornstarch last), stir well, and set aside. Heat the sesame or olive oil in a wok or large skillet over high heat. Remove the meat from the marinade and add to the skillet, in batches if necessary, in a single layer so the meat is not crowded. Sear meat (don’t move it around) and then flip and do the same, until almost cooked through, then remove to a plate. Add more oil if needed and add the onions and peppers and cook until softened. Add in the garlic and white parts of the green onion and cook until garlic is slightly browned. Add the meat back in, the pour in the sauce, stir, and cook until meat is cooked through and sauce is slightly thickened. Stir in green onions and serve over rice! Yum! This sounds so good. I love trying new stir fry recipes!